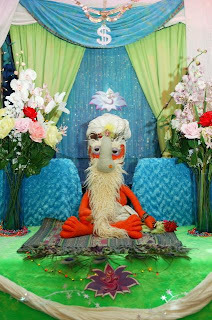 Gone to India to study with my new Guru, Puppetji. Yah, I had already been watching Puppetji. He is my mom's new guru. My head became wooden when I studied with Puppetji. Then I became enlightened and my head caught fire! Always good when you come to visit, Isaiah. Thanks! So Isaiah, seitan is a veg protein made from wheat gluten. I think it's tasty. I make my own but you can also get it premade at places like Whole Foods in the refrig section. p.s., it's totally tasteless but have you seen the videos by "Trev the Builder" (not the same trev) on YouTube? Search Yoga 4 Fellas. He has 4 vids. I can't help laughing at them.